With the sun shining and crisp, cool air moving through the windows, I am feeling grateful for this peaceful Monday morning. I know I don’t fully understand this verse. Jesus’ overcoming the world is a large, far-reaching concept. But what I do understand about this verse touches my life in many ways. It contains important truths about God’s character and our lives. In the first part of the verse it is important to look back at John 16 as a whole. (33 is the last verse of the chapter.) Jesus has just shared with his followers what is about to unfold: Jesus’ death, resurrection, ascension, and the coming of the Spirit. He tells them that the Father loves them. He also tells them that they (the disciples) will leave him (Jesus) and be scattered. But he speaks plainly and honestly, and they recognize that he is doing so in verses 29 and 30. With “I have told you these things” in the beginning of verse 33 we see that Jesus is honest and trustworthy. This informs our understanding of the character of God. With the next part, “so that in me you may have peace,” we see Jesus’ (and therefore God’s) love and care for us. He wants us to know peace in our hearts as a result of trusting his words. When Jesus tells his followers that they “will have trouble,” he is both stating a fact because we live in a sinful world, but also foretelling how life would change for his followers after his death and resurrection. This shows again that Jesus is honest and trustworthy, and cares for us enough not to sugar-coat the truth. But “you will have trouble” is not the end! It is not consistent with the character of God to share honestly about the troubles we will face without offering hope and a solution, hence “Take heart!” “I have overcome the world” is the part I know I don’t fully understand. This must have been a mind-blowing thing for the disciples to hear, as well; maybe not in that moment, but probably when they looked back on the conversation. Jesus had not yet died, risen again, or ascended, yet he had already overcome? Yes, of course, because he was not just fully human, but also fully God, and knew what his death and resurrection would accomplish. And he did it anyway, and he told his followers about it plainly, and he wanted them to place their trust in him as they navigated life in light of what was to come. Jesus wants the same for us as he did for his disciples: to take heart and trust in the one who has overcome the world. The Bible tells us Jesus is the same yesterday, today, and forever (Hebrews 13:8), and there are countless other passages in Scripture that tell of the consistency of God’s character, his love for us, his plan for redemption through Jesus, and his promises to be with us as we walk through this troubling world. And all a person needs to do is believe that Jesus is the son of God who overcame the world in order to take part in his victory. As I reflect on this verse today, I come to this conclusion: I should not be surprised when I face trouble. I should not judge God to be unfair or unkind. Rather, I should be thankful and joyful for a Savior who told me the truth (that I will have trouble). I should trust him to be with me, strengthen me, encourage me, and guide me as I go through my troubles. Today is not a very trouble-filled day, but those days have come and will come again. When they do, I can “take heart” and not be overtaken by the trouble of this world because I trust in the one who has overcome. I kind of feel like a “woohoo!” is in order here! 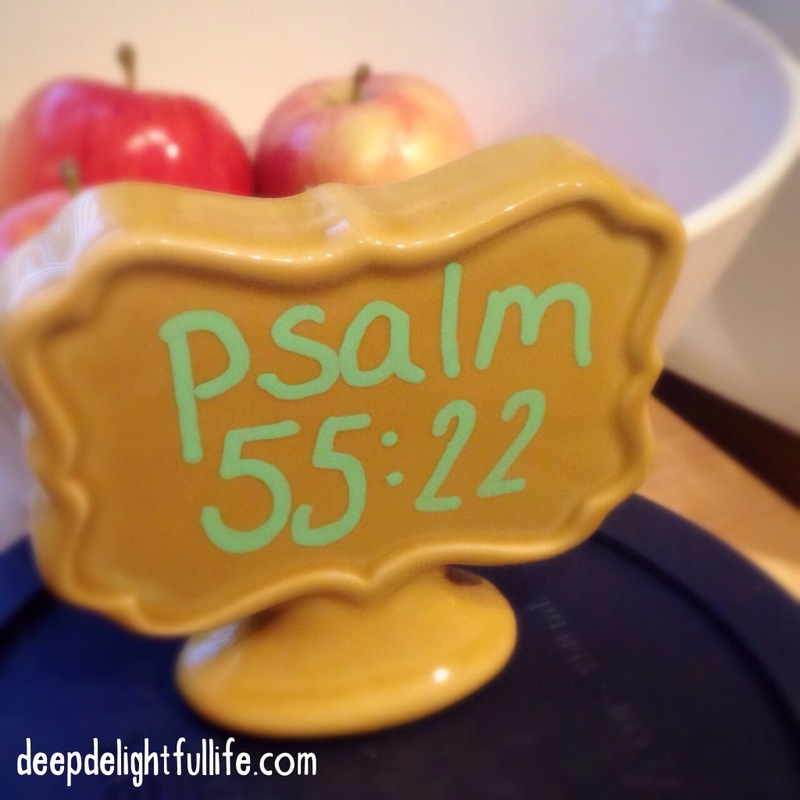 Finally, I have used this verse in preschool in the past, and would like to share a printable from BibleStoryPrintables.com for it. They have a variety of coloring and tracing pages that you could use with a pretty wide range of ages for this verse (and many more). How does this verse speak to you? Are there other verses that come to mind as you think about the concepts Jesus touches on with just one sentence?